Yeah, I know that doesn’t really look like Bill. I was in a hurry. And I’m a crappy caricaturist. Regardless, I like how he comes of as a mix between a guy selling drugs and a Jehovah’s Witnesses. So, anyways. Windows 7‘s coming out soon. And I’ve barely even used Vista yet. I’m so after. This entry was posted on Monday, June 29th, 2009 at 6:00 am and is filed under Comic. You can follow any responses to this entry through the RSS 2.0 feed. Both comments and pings are currently closed. However I noticed that the desk is just at Leslie’s knees. Is Gates sitting on the floor? Gates likes to sit really low and Leslie’s standing on a… box. Myes. Box. OK, SO I WAS IN A HURRY. 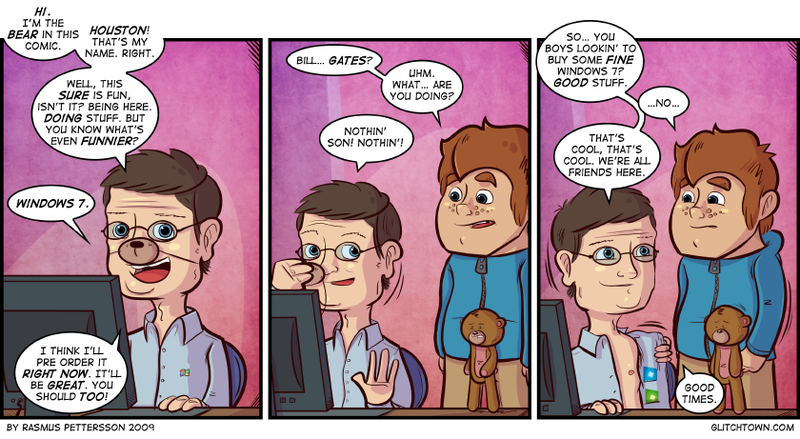 That really is a good Glitchtown-style Bill Gates. As far as Windows 7 goes… it’s the best Windows Microsoft has made since NT. Seriously. It’s got a Mac OS X like dock.